Falmouth Maine real estate continues its strong sales trend through October 31, 2014. During the first ten months of the year sales of single family homes are up 17.9% – (171 homes vs 145). Pricing is also up an impressive 13.9%. The YTD median price is currently $450,000 compared to $395,000 in 2013. Both of these results are better than Cumberland County as a whole. 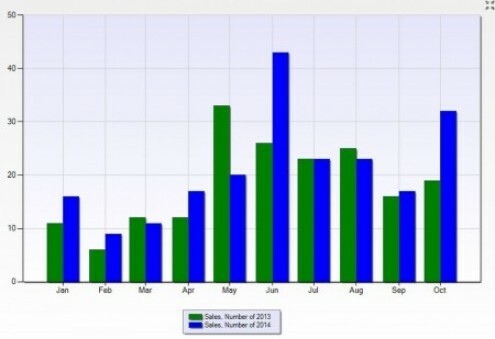 The graph below highlights monthly sales from January through October for the last two years. October was an exceptionally strong sales month. Although prices are up YTD, over the last several months prices have stabilized, as the graph below illustrates. 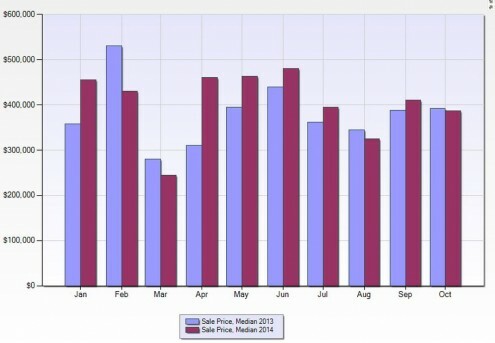 Interestingly, in two of the last three months the median selling price in 2014 was lower than 2013. Much of this is a reflection of the mix of homes that actually sell, compared to concerns about a declining prices. Over the last three months inventory has increased. The inventory level at the end of October was the highest it has been in any October since 2011 and the third highest of 2014.